This home uses gray water to irrigate riparian trees that surround a rainwater-fed pond. 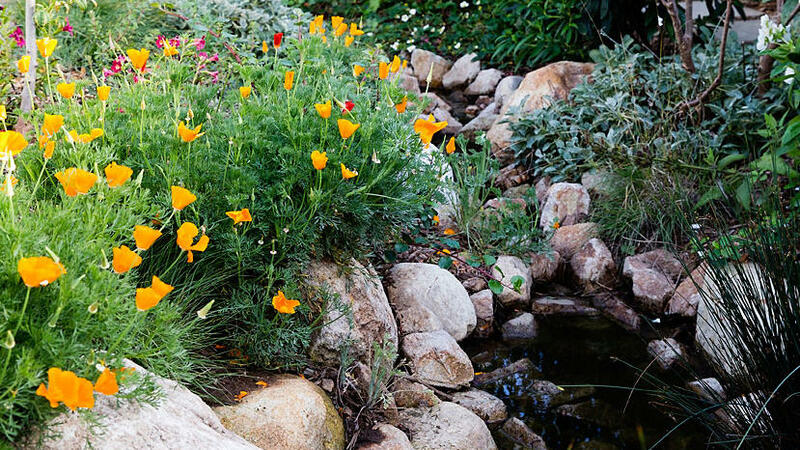 As California pushes through the drought, many homeowners look to gray water for solutions. While some options call for detailed designs, other practical techniques are as simple as placing a bucket in the right place at the right time. Drought-conscious Californians can help meet Governor Brown’s 25% water reduction mandate by utilizing these home-scale, gray water methods. Imagine the abundance of fresh water flowing down the drain, as the shower warms. The average American soaks up 17.2 gallons while rinsing; yet many residents in older homes end up wasting the first few due to chilly temperatures. Capture this excess with a 3-gallon bucket. Use it to water edible plants or front yard foliage. Those looking to go the extra mile can even re-use bath water to hydrate lawns and ornamental plants. Stretch it even further by dumping this in the toilet bowl for water-wise flushing. The average toilet uses 3.6 gallons per flush, so these mindful moves make a difference. Just be sure to use collected gray water within 24 hours to avoid bacteria buildup. Water-wise cooks can conserve in the kitchen by placing a plastic basin in the sink. Collect water while rinsing vegetables or washing hands, and sprinkle across the front lawn. City dwellers without dishwashers can also recycle dish-soaking water in ornamental gardens. In 2009 California declared it legal to divert washing machines to home gardens. Art Ludwig, author and ecological systems designer of Oasis Designs, led the effort and has since served as a hub of knowledge for water-wise homeowners. 40 million Californians can now save anywhere from 14-40 gallons per load with Ludwig’s laundry-to-landscape installation. Ludwig’s system takes full advantage of the washer’s pump by dispersing water from the machine to the garden. Homeowners can re-direct 10 to 25 gallons of water per load for a horizontal-axis machine, or about 40 gallons per load for a vertical axis machine. When using a biocompatible detergent this gray water can irrigate ornamental plants and fruit trees, including citrus. Instead of attaching a garden hose to the washer, Ludwig uses 1-inch polyethylene to accommodate the rush of water from the washer without a surge tank or stressing the pump. Check out the specifics here. This eco-design can be used everywhere in California. Numerous cities even provide rebates, including Santa Clara Valley, San Francisco, Santa Barbara, Palo Alto, Los Gatos, Marin, Goleta, Soquel, SF East Bay, Santa Rosa, Thousand Oaks, Santa Cruz, Monterey, Carpentaria, and Mountain View. Collecting buckets and reconfiguring washing machines are just a couple ways to recycle water. Homeowners interested in more elaborate systems have additional options. Bathrooms sinks can connect to adjacent toilets, funneling faucet water to fill the toilet bowl. Kitchen sinks can also be hooked up to gray water gardens, where underground piping flows into ornamental gardens. To avoid cross contamination, gray water systems must be designed to prevent backflow into the potable water system. These methods generally require permits from local authorities, so consult your city before constructing. For more details explore Ludwig’s recap on California’s gray water regulations.